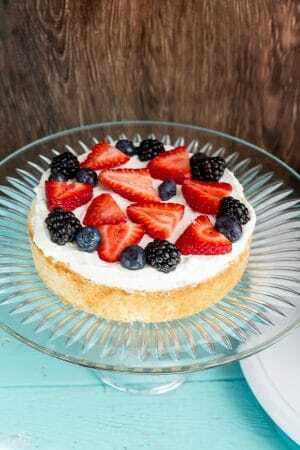 Easy Berries and Cream Sponge Cake makes the perfect celebratory dessert for summer. Best of all, it’s easy to customize with your favorite berries. 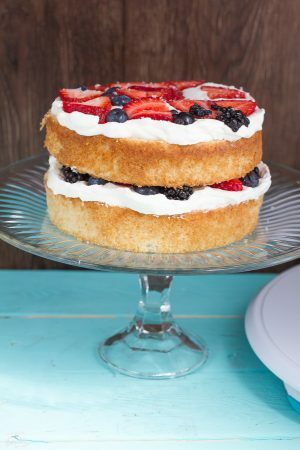 Made with layers of vanilla sponge cake, stabilized whipped cream, and fresh ripe strawberries, blueberries and blackberries. I’m starting the week off with a cheerful and summery cake which is sure to brighten up any Monday. There’s still one more week of August so now is the time to indulge in all the fresh berries while you still can. 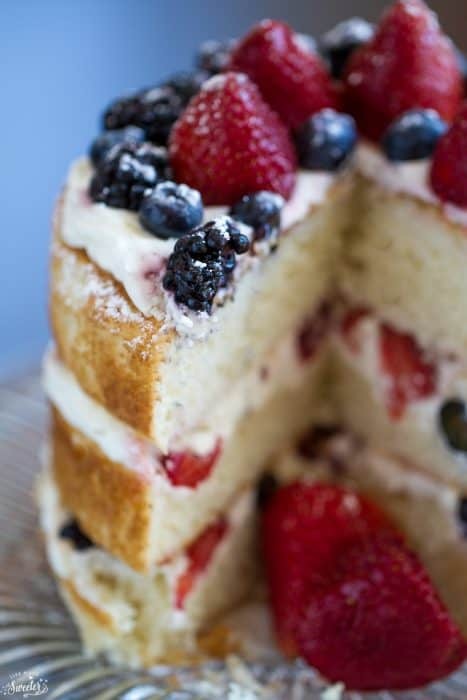 I’m finally getting around to posting this Berries and Cream Sponge Cake I made for the summer afternoon tea party (click HERE to read about it) I threw using my KitchenAid stand mixer I received back in June. 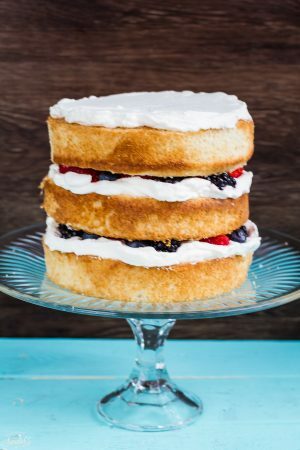 It’s made with three layers of light and airy sponge cake generously filled with fluffy whipped cream then topped with lots of fresh juicy berries. Since I was hosting the tea party somewhere else and would have to transport the cake, I stabilized the whipped cream with bloomed gelatin so that it would hold up underneath all the added weight from the fruit. Gelatin helps the whipped cream stay fluffy and not break down for a longer period of time but if you’re going to be serving this right away then feel free to leave out the gelatin. The sponge cake is a simple, everyday kind of cake and can also be baked ahead of time and refrigerated (wrapped in plastic wrap) until ready to assemble. It has a rustic naked look, which I happen to love even more than a frosted cake. 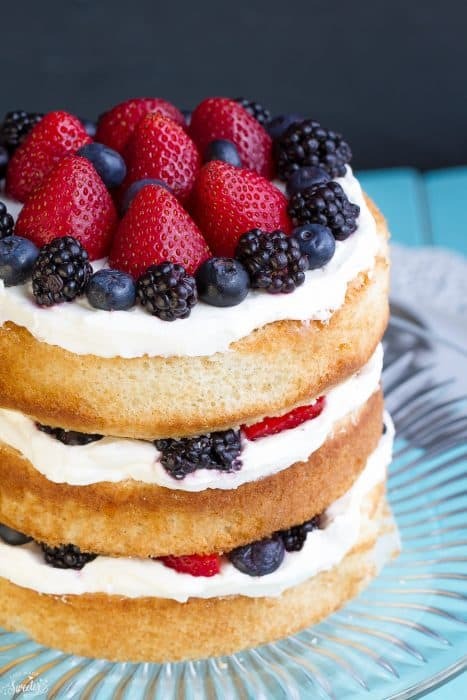 When you dress it up with fresh berries, it makes a beautiful centerpiece that is perfect for a fancy afternoon tea or dinner party. 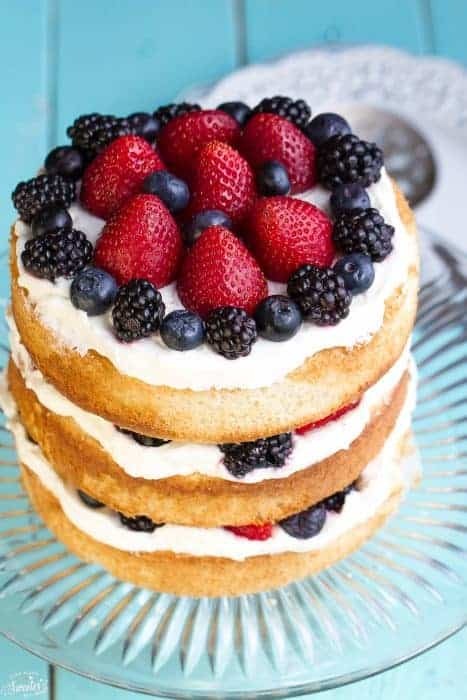 It also makes an impressive dessert that would be perfect for birthdays, a bridal or a baby shower, or any other excuse for using up the rest of your summer berries. 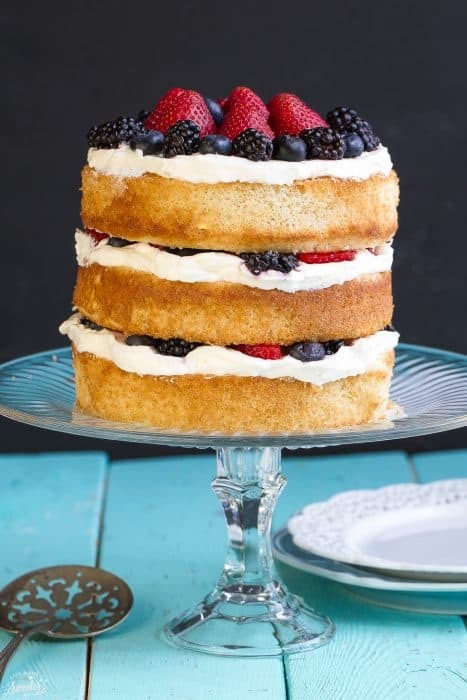 Delicious and easy Berries and Cream Sponge Cake made with layers of vanilla sponge cake, stabilized whipped cream, and fresh ripe strawberries, blueberries and blackberries. Make the cake: Preheat the oven to 350 F. Spray three 6-inch round cake pans (or two 8 inch pans) with baking spray and line bottoms with parchment paper. In the bowl of a stand mixer, beat together the eggs, sugar and vanilla until it has tripled in volume - about 10 minutes. Mixture should be thick, creamy and pale. Add the lemon zest. Sift the flour and salt (preferably three times) into a separate bowl or a large parchment paper on the counter. Stir into stand mixer using a plastic or metal spoon, preferably in batches. Add the melted butter and gently fold it in to the cake batter mix. Divide the batter evenly between the pans and gently smooth the tops. Tap the cake pans on the counter to remove any air bubbles. Bake in preheated oven for 21-25 minutes or until the sponges are evenly golden and come away from the sides of the baking pans. Allow the cakes to cool in their pans for 10 minutes. After 10 minutes, turn them onto the wire rack carefully and allow the cakes to cool completely. Meanwhile, make the whipped cream: In a small pan, combine gelatin and cold water and allow to sit for 5 minutes until thick. Place over low heat, stirring constantly, just until the gelatin dissolves. Remove from heat and allow to cool slightly (but do not let it to set). 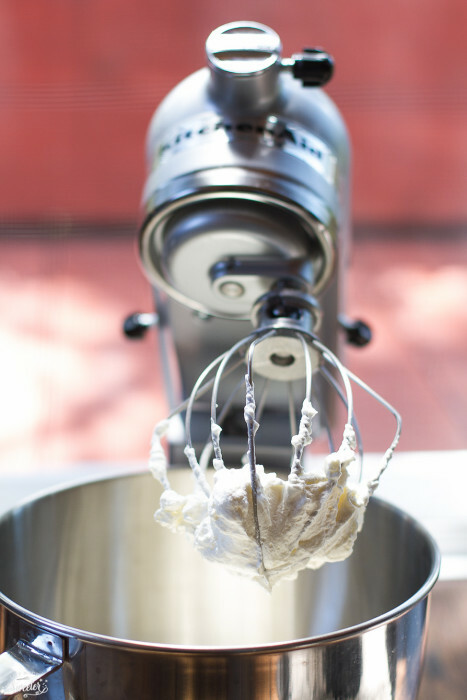 Using a stand mixer, whip the heavy cream with the icing sugar until soft peaks form. While slowly beating, add the gelatin to the whipping cream. Whip at high speed until stiff peaks form. Place your first layer of cake on top of a cardboard circle, serving plate or cake stand. Spoon a generous layer of whipped cream and spread evenly using an offset spatula. Place an even layer of sliced strawberries and berries on top of the whipped cream. Add the second layer of cake and repeat until all of the layers are on the cake. 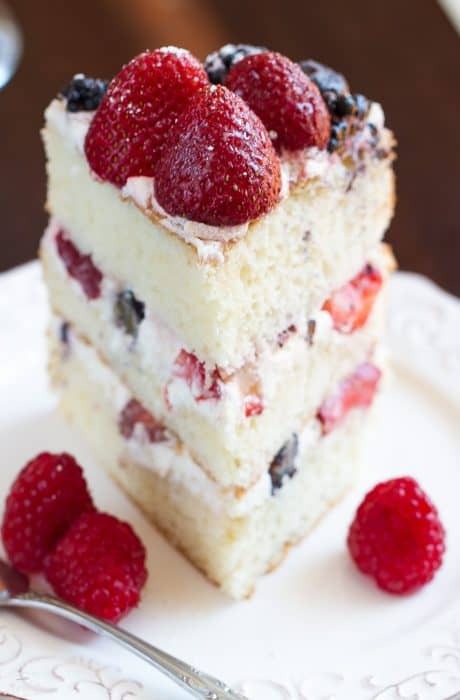 For the top layer, spread on with a generous layer of whipped cream and spread evenly using an offset spatula. Garnish with fresh strawberries, blueberries and blackberries. Dust with powdered sugar. Disclosure: I created this post in partnership with KitchenAid and received the mixer and bakeware to create the recipes you see for this Summer Afternoon Tea Party series. As always, all opinions are 100% my own. Thank you for helping support brands that I love!